How many times have you wished you could turn back time? If only you saw that leak a few days earlier…...if only. As a home owner you could save a lot of money be being pro-active instead of simply dealing with problems as they turn into disasters. If you’re in the property industry you know the costs relating to mould, moisture and leak problems in domestic & commercial properties. Now you know why the thermal imaging camera for leak detection market is expanding. If you don’t know it yet: These cameras can see through walls to help you detect leaks, so now you can take action before there’s even a real problem. There are also thermal cameras for electrical inspections and home inspections. Sound good? Here are some of the most important things you should know. Yes, you can do manual checks and look for moist areas in your building. However, you may not realize the extent of the problem by using a traditional method. You need the modern technological method. 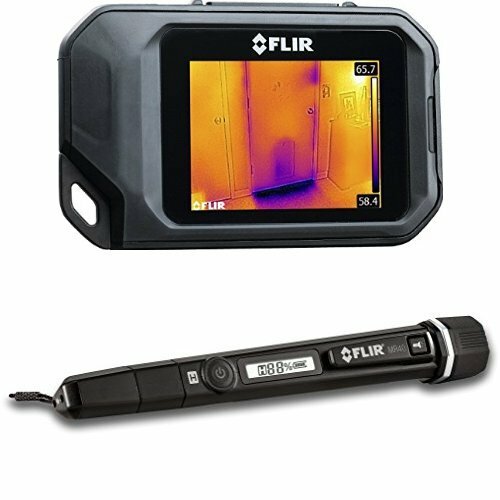 With an added feature some thermal cameras have, you can use a moisture pen to then determine the extent of the problem. But you won’t even know where to push in that pen if the camera wasn’t there. So, can you see why this is an investment for any home, building restoration project, property group or business owner? Price: If you’re shopping for personal use you can settle on a low end unit since you won’t need it everyday. For corporate use as a service provider you need details, data and you’ll be using it a lot. A higher price means it will provide you with necessary data and be durable enough for regular use. Application: Where will you use yours? Service providers who work in less than optimal conditions (such as navigating through rubble of a restoration project) need rugged equipment. A heavy duty thermal camera won’t break on the first accidental drop. Extra features: Does the unit give you what you need? If you require details on the moisture level a moisture pen is essential. Make it easy on yourself by getting a unit that - with the help of laser - shows you exactly where the camera is pointing at. It makes it easier to use but it also means you won’t accidentally open up the wrong area of the wall. If you’re looking for hidden pipes this is essential. An additional source of information is the humidity in the room. A thermal camera with a humidity sensor can tell you if there are higher than normal levels of humidity. This can also be proof that moisture is retained in the walls or roof. Reporting: For home use you won’t need reporting features, but for professionals it’s essential. You must be able to share the data with others and have software to create reports. User friendliness: These gadgets use advanced technology but manufacturers should make it easy to navigate. An easy menu means home owners and professionals can all benefit from them. Also invest in a large enough screen if possible, so you don’t have to guess at the details. Durability: As stated, a unit used by professionals need to withstand rough handling without wearing and tearing. However, if you’re simply going to use it at home once in a while and you care well for your tools, save money and purchase a lower end unit. Rather invest in other features. Accuracy: Of course, if the data determines while wall to break down or roof to break open, you need the unit to be accurate. A quality sensor that gives clear, correct readings is a must in any application. For this you need a camera that’s able to detect even small anomalies, so a problem doesn’t have to exacerbate before your camera detects it. You also need a quality pen with state of the art contact pins. Make sure you have enough features because the more data you have the better you can deal with the problem, right? And now it’s time to find the one you want. 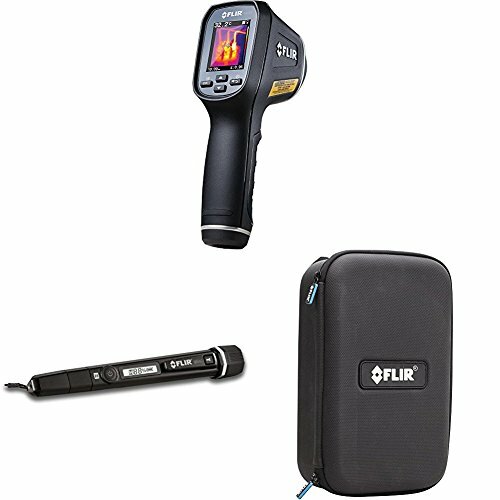 This is quite a comprehensive kit as it includes an imaging meter, humidity sensor and a temperature meter. You can also select how you want to view the results in one of four color palettes on the 4800-pixel screen. The external pin probe will help you determine details of the problem after you’ve discovered the general area of the leak. The pin’s measurement depth is 0.75”. To share reports it’s easy to download data via a USB connection so it’s a user friendly tool almost anyone can use. However, some users require a learning curve before they enjoy the full benefit of it. It weighs 11.4 oz (MR176) which isn’t light, but at least you know you’re getting a sturdy, quality product. It measures at 24.1”x 11.1”x 18.1” so make sure it will fit in your kit before buying. Luckily you get a handy carry case with allocated storage space for different components. This is an excellent tool for home use, with adequate features for general application. However, professionals may need something more advanced and more accurate sensors. You’ll also want even better resolution. Here you have a compact unit with minimal components that will help you a lot in future. 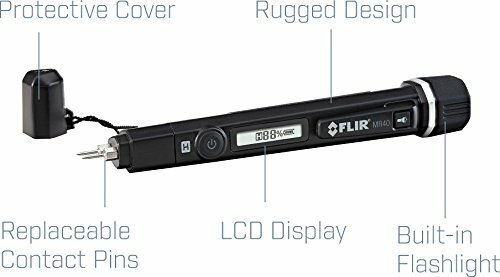 You get a quality thermal imager and a moisture pen that can be packed away neatly in the brand’s protective carry case. The case makes it practical for professional use too. The extra feature of a flashlight makes it possible to use this at night, in dark spaces on construction sites where there’s no power yet, or in your basement if there’s a power failure. If you’re looking for leaks during emergency conditions this combination of features will save the day. The sensors are reasonably sensitive and accurate so you can detect problems even from a distance. Your measurements can be downloaded via USB or placed on a microSD card (included in purchase), making this user friendly for professionals. Just note that this is more an imager than a camera which makes the background details less clear. However, it still works and because it’s designed to also help detect other problems such as shorted electrical components, it’s a good investment for any home owner. Despite its many features it’s surprisingly user friendly and intuitive which makes it viable for professional & private use. This is such a practical design for professionals as the size and weight make it comfortable to store in most clothing pockets or a backpack. You can keep it with you while doing inspections all over a building site. You’re informed of results in more ways than one as you can look at the screen with clear detail or you can listen for the audible indications. Different ranges are paired to different sounds. The pen’s pins can easily be replaced and this component has a rugged exterior for heavy duty use. 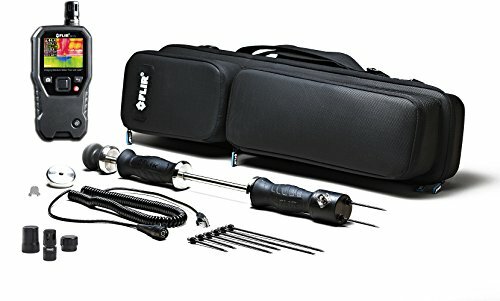 A nifty feature is that the LED spotlight doubles as your flashlight in dark environments. It has an auto power off feature so you’ll save energy and your battery will last longer. That’s a must have for most professionals. The resolution is also acceptable for professional use. Be prepared for some lag as it often causes you to wait while it calibrates. This just means: Make sure you set aside enough time for your inspection. In some scenarios you may also want a cover for the screen so hopefully the brand can include this in future. For now the rubber bumper will have to suffice. Why wonder how big a problem you have if a camera and a probe can tell you exactly what to expect. 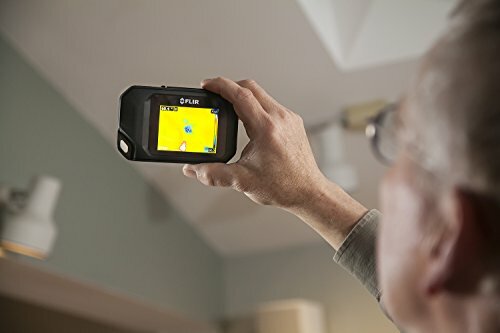 There’s a thermal imaging camera for leak detection in every price range so whether you’re a home owner or a home inspector you never have to be caught off guard by leaks again.